The nose has special cells which help us smell. The technical term for sense of smell is ‘olfaction’. Your nose can help detect dangerous chemicals in the air. The human nose can smell many different odors but is far less sensitive than other animals such as dogs. The human nose has 2 nostrils. The 2 nostrils are divided by the nasal septum. 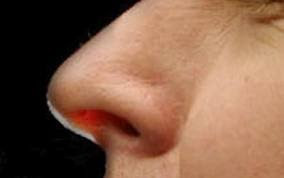 The nasal septum is made up mostly of cartilage, a tissue that is stiffer than muscle but more flexible than bone. Found at the roof of the nose, the ethmoid bone separates the nasal cavity and brain. The ethmoid bone is also one of the bones that make up the orbit of the human eye. The nasal cavity is a large space found inside the head, above and behind the nose. Air passing through the nasal cavity is warmed to match body temperature (or cooled if it is very hot). Dust and other particles are removed in the nasal cavity by short hairs. The floor of the nasal cavity is also the roof of the mouth. Aside from playing a crucial part in your appearance and providing protection from infections, the nose may also affect the resonance of your voice. As we age, the nose lengthens and droops downward. Rhinoplasty is the name for a nose job. It’s the second most common cosmetic surgical procedure done today. In 1890 Professor Lees Ray, of Liverpool, England, invented a Nose Improver machine designed to press any nose into the desired shape. His advertisement for the product read — “from nez retrousse to nose Hebraic”. According to experts, nasal grooves in the nostrils are rich with pheromones that lead to sexual attraction. According to the Center for Disease Control and Prevention, more than 400 deaths occur in the United States each year because the nose is unable to smell natural gas and carbon monoxide. Your character may be judged based on the shape of your nose. The ancients believed that a strong, long nose signified strength and power. A woman’s nose can detect more scents than a man’s. ‘Anosmia’ is the inability to smell. ‘Dysosmia’ is when things don’t smell as they should. ‘Hyperosmia’ is having a very strong sense of smell. On average, men have larger noses than women. It is traditional for Maori people in New Zealand to press noses (hongi) as a greeting. Plastic surgery involving the nose is called ‘rhinoplasty’.